Charity shop score. Qing (Qianlong??) 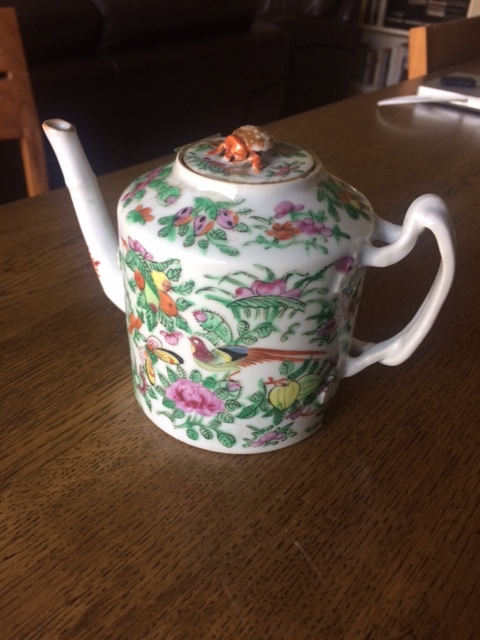 teapot, from possibly late 18C to perhaps 1820/30. Famille Rose pattern. 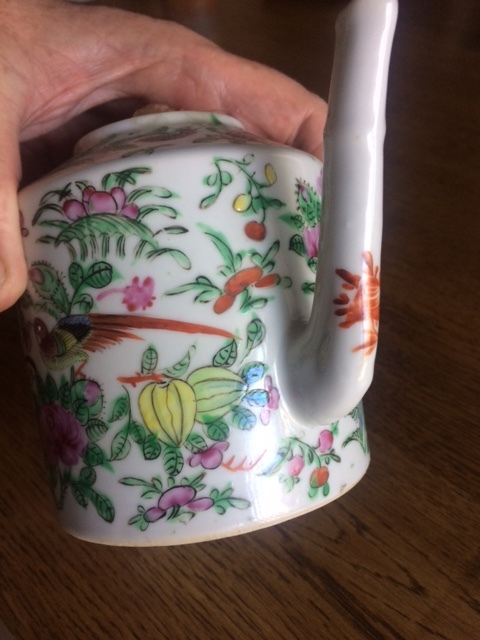 Note strap handle; bud finial; bamboo/tapered spout emerging low from the straight-sided or drum-style pot. Perfect condition. Worth? Unsure. Let's be conservative and put it at $250 US. Yes, these things can still happen. I purchased it on a complete hunch. Images very symbolic: peaches; lotus; melon, gourds, golden pheasant; butterfly, peonies and more. Very nice find. Maybe a silly question, collect or use. I've just came to a time that life that I don't keep nice things I don't use. By the way is that a beetle or a mushroom on the top? (11-23-2016, 08:51 PM)GreeneMD Wrote: Very nice find. Maybe a silly question, collect or use. I've just came to a time that life that I don't keep nice things I don't use. By the way is that a beetle or a mushroom on the top? Oh I have so many teapots that, well, this one is just to look at, although I take your not-at-all-silly point. 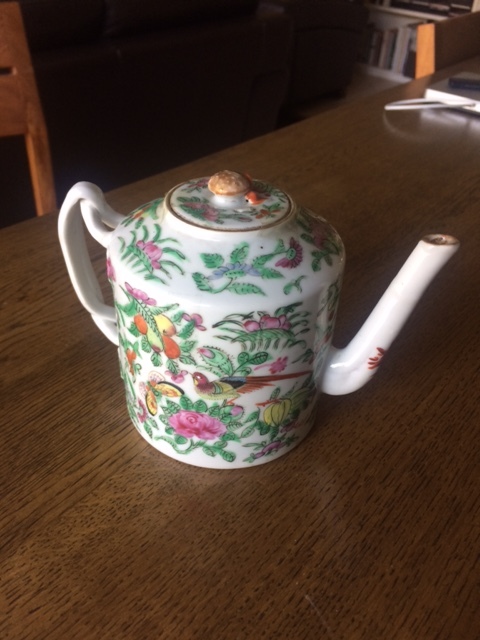 The teapots that I do use are the "Brown Betty" variety, which are also vintage, and make very good tea indeed, favoured by tea connoisseurs the world over. It's all because of their shape and the clay from which they are fashioned - which is reddish, and heavy/dense - that they are considered the best. The finial at the top of this particular pot is simply known as a "bud", and depicts neither a crab nor a mushroom, etc.